As you cross the Mojave Desert on I-15 there’s a site that I think you might find worth visiting -- a relic of early years of the last Century. Exit the freeway at Basin Road (15 miles west of Baker) and drive about ½ mile south from the freeway. To your right, you should see two tall wood pilings sticking out of an earthen bank. From there, walk or drive a short distance toward the wash (north latitude 35.095, west longitude 116.271). When you reach this point, you’ll be standing near the spot where the photograph shown below was taken in 1919. In 1907, Joe Nelson was the first person to apply for a homestead on public land in the East Cronese Valley. Of the 34 homestead applications filed with the Public Land Office between 1907 and 1932, all but four were cancelled. Over this period, only a few settlers built homes and actually took up residence in the valley. Elmo Proctor’s service station and desert museum was probably the last. He was still operating here in 1940. Most of the applications were filed under provisions of Desert Land Entry, established by Congress in 1877 to encourage development of arid and semi-arid public lands in the western states. Citizens of the United States could get title to up to 360 acres if they could prove that an adequate source of water would be available to sustain agriculture. In 1910, eighteen valley homesteaders experienced massive flooding by the Mojave River resulting from storms in the San Bernardino Mountains. It was reported that water stood ten feet above the floor of the lakebed. It should have been obvious that the East and West Cronese lakes periodically received the overflow during exceptionally stormy years. The wave cuts around the edge of the valleys give a pretty good clue. In 1912, The Valley Cultivating Co. filed for water from the Mojave River to be used for the development of agriculture in the East Cronese Valley. Initially, a ditch was proposed to divert water from the river to the West Cronese Valley for storage. This proposal was dropped when it was found that the lake bed was too salty and that water pumped back into East Cronese Valley would not be suitable for agriculture. 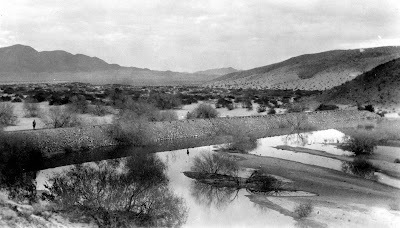 In 1916, the valley again was inundated by flood water from the Mohave River. By this time 27 homestead applications had been filed in the valley. Most were based on speculation and the hope that river water could somehow be diverted to the valley. In response to popular hopes, the Valley Cultivating Co. filed for a right-of-way to construct a dam at the point where the river overflow channel enters the valley. It was designed to eliminate periodic flooding and to impound water for irrigation. The dam was completed in 1919 (photograph below). Anchored at both ends to native rock abutments, the dam measured 10 feet in height, four feet in width at the top and 30 feet in width at the base. An earthen dike was constructed along the east side of the channel for the distance of about a mile. The project was abandoned in 1924 after flood waters broke through the dike and again inundated the valley to a depth of four feet. Poor soil and lack of an adequate source of water spelled the end of any attempt to establish agriculture here. In 1958, the Union Pacific Railroad removed the dam and opened a spillway into Cronese Valley to relieve flooding of its facilities located in the main channel of the Mojave River four miles south of the dam. I visited the dam site a few months ago. The two pilings are still there and you can trace the dike that runs generally south near the road. There is evidence that this area has attracted campers whom I’m sure had no idea what was going on here so long ago.